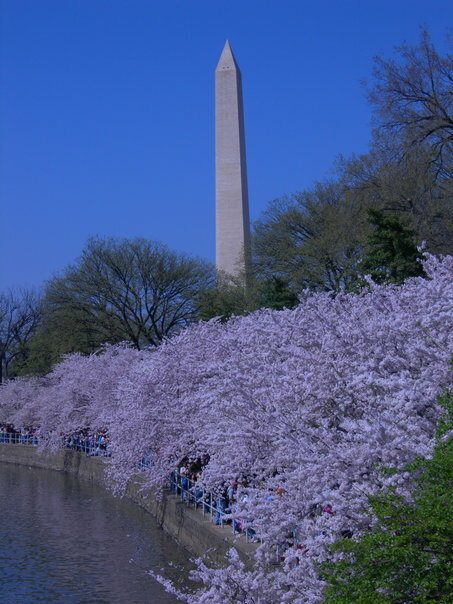 Ever since the early 1900 when, Japan gave the Cherry Blossom trees to the United States, they bloom year after year, symbolizing life and rebirth. In celebration of the gift of the trees, the Nation’s Capital puts on its biggest festival. 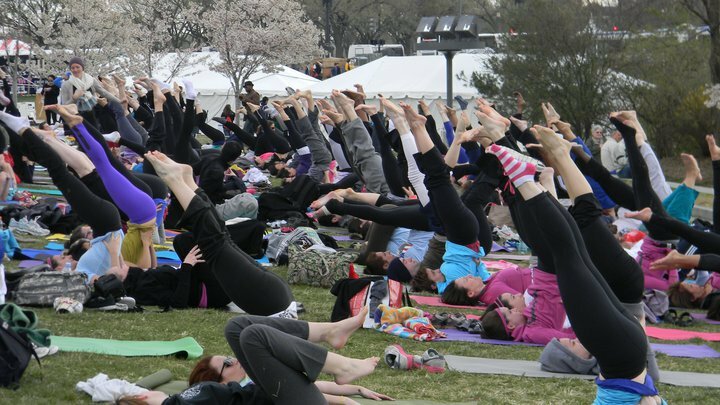 Two of my favorite parts of the festival are the Cherry Blossom 10 miler and Yoga on the National Mall. 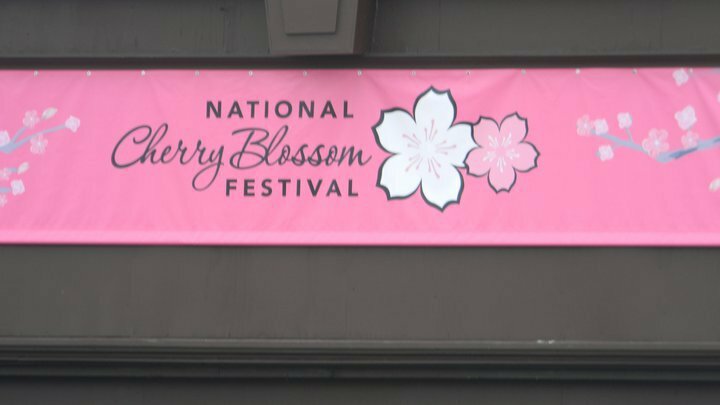 Every year, The Cherry Blossom 10 miler is packed with about 15,000 runners, including some elite runners. It use to be first come first serve, but because of it’s popularity, it is now a lottery sign up. 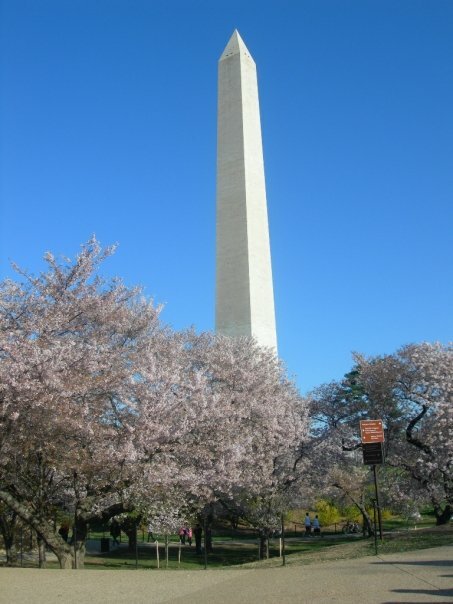 The race starts at the Washington Monument, goes over the Memorial Bridge, loops around the Tidal Basin and finishes back on the National Mall. My favorite part of the race, is heading toward the memorial bridge. It is there, opposite of us average runners, who have just started to run our race, that you can spot the elite runners sprinting towards the finish line. Seeing them, creates an amazing energy, so amazing it is indescribable. I also love running by the Tidal Basin, but it can be a hit or miss. It is a hit, because a canopy of white and pink blossoms normally hang over your head, and when they do, it is breath taking. In that moment, I want to turn off my ipod, and grab my camera. But it becomes a miss when the weather gets too warm too fast, or too cold, or windy, the delicate flowers might be destroyed, making the Tidal Basin, bare and boring. 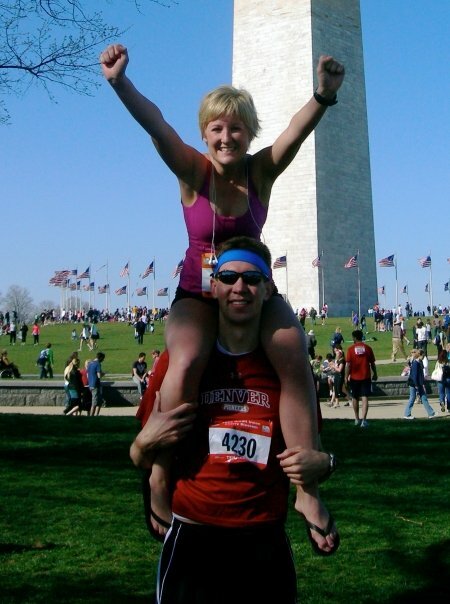 In 2008, the Cherry Blossom 10 miler was my very first long distance race, and I have been running it every year since. 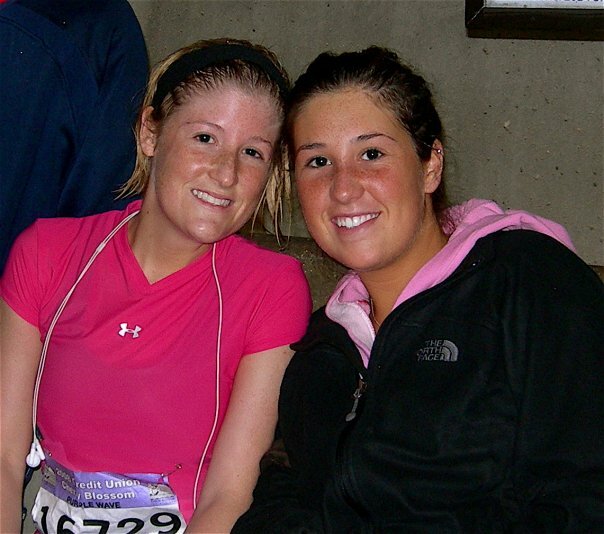 In 2008, it was rainy and cold, but in the spirit of the the Cherry Blossoms, my sister and I wore bright pink shirts. We ran it in a consistent 9:48 pace, finishing in 1:38:09. That day, after accomplishing that race, I felt different. In ways, that race defined me as a runner, because it was then that I felt I could truly call myself that. 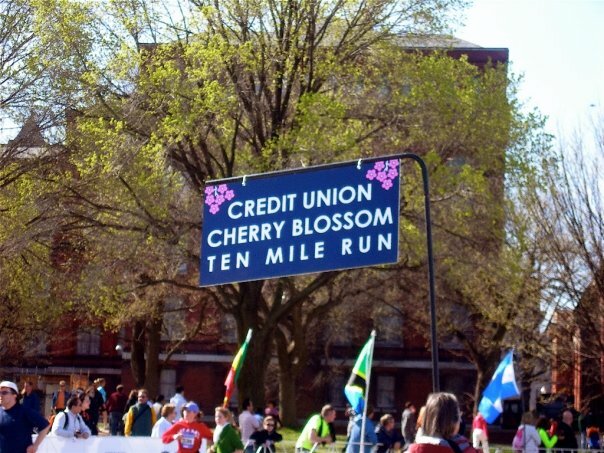 This year was a very special year because it was the 100th year of celebration of the gift of the trees, and it was my 5th time running the Cherry Blossom 10 miler. 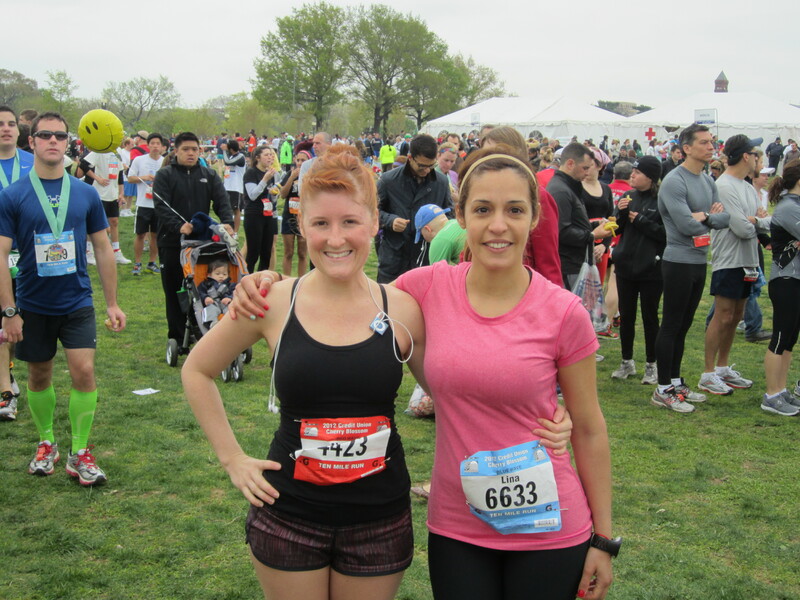 My sister didn’t run this year, but my new running buddy, Lina, a coworker of mine, ran it for her very first 10 mile run. 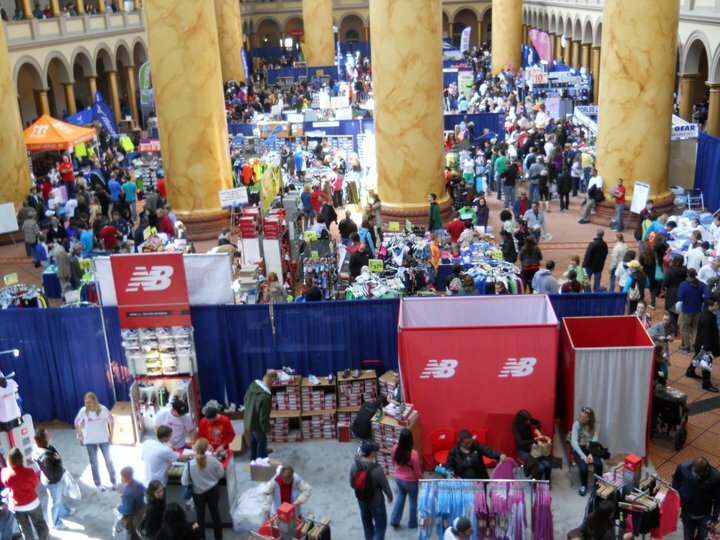 The friday before the race we headed to the expo, which was held at the National Building Museum, to pick up our bibs, and do a little shopping. 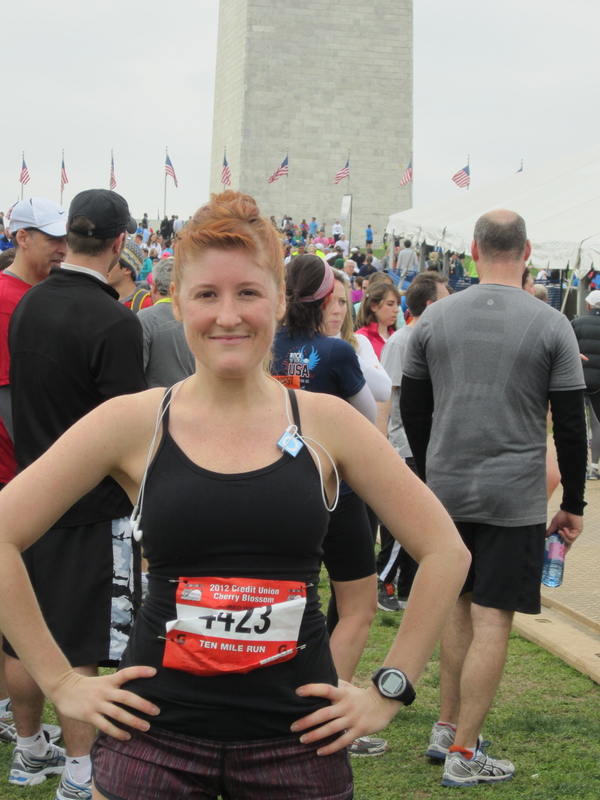 On the Saturday, before the race, I headed to lululemon to find a fun running outfit. I know that it is usually a big no no to wear something unfamiliar the day of the race, but I actually like racing in something new. 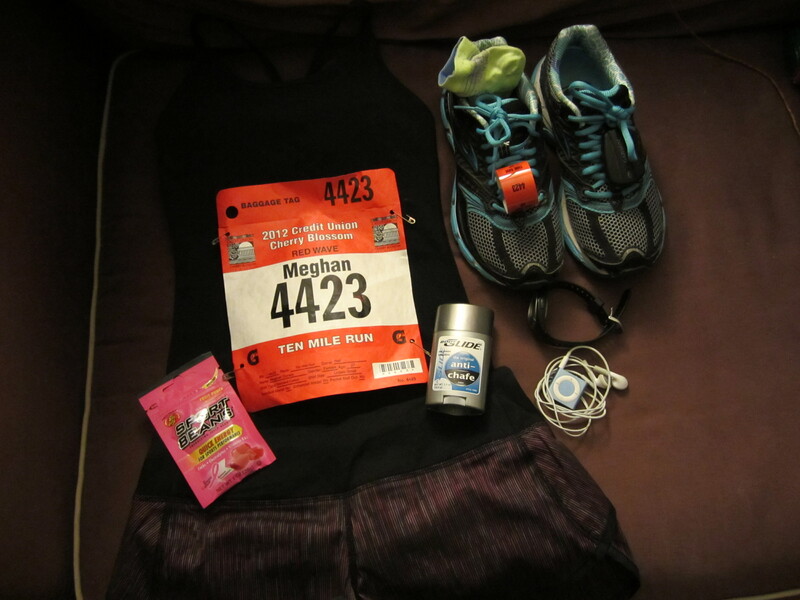 I prepared my running things the night before and headed to bed early. I woke up at 5:30 am and then Lina and I walked to the Metro. We arrived to the start line around 6:30. It was dark and cold. When the race began we ignored the fact that we were in different corrals, and we both squeezed in with the 9 minute pace group. It is important to get in the proper wave because if you get stuck in the back, it will cause so much frustration trying to squeeze pass other slower runners. I usually start off a little slower to warm up and then I ease into my pace. I kept a good pace most of the race stopping a couple of the water stations to refuel. I ended up running it in, ‎1:29:26, making a new PR. Lina was not far behind me. 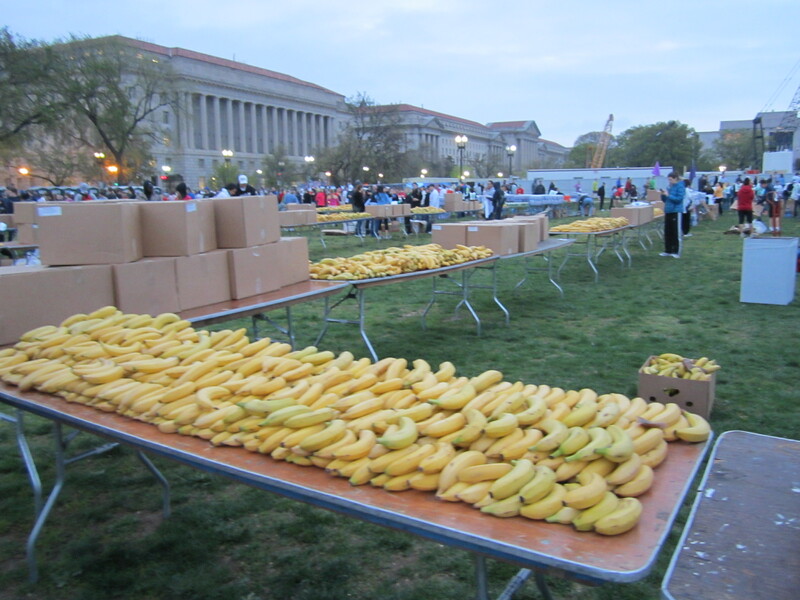 When we got to the finish line we got to chow down on bananas. 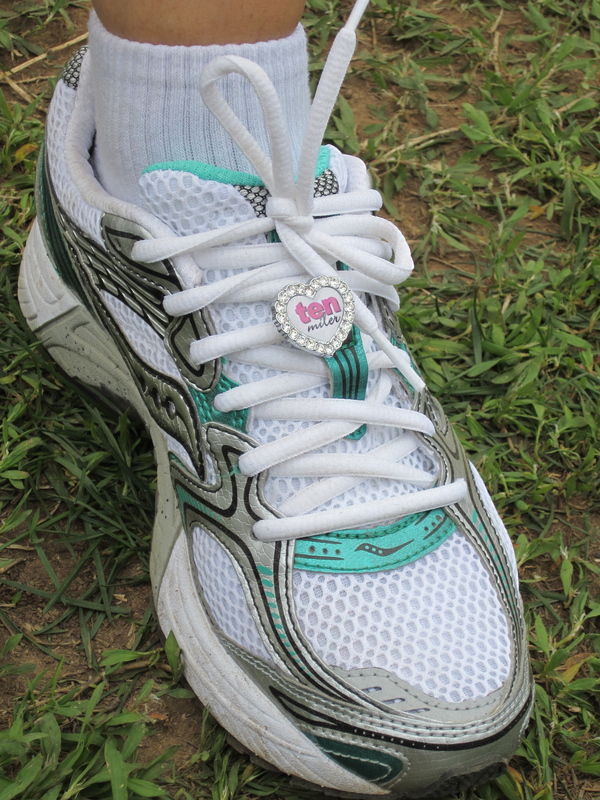 Lina has some bling bling on her shoe! 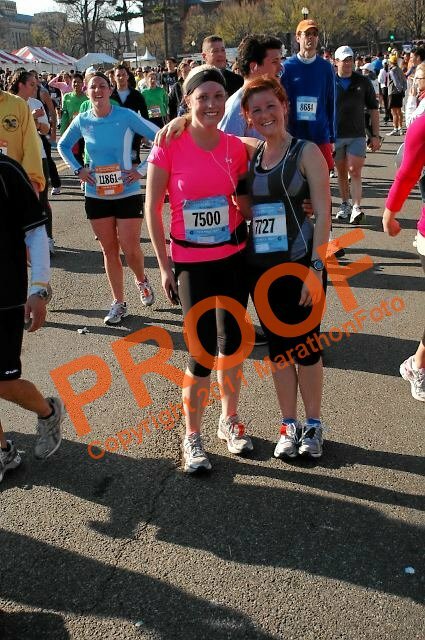 Although, this race was fabulous, so were the previous ones. 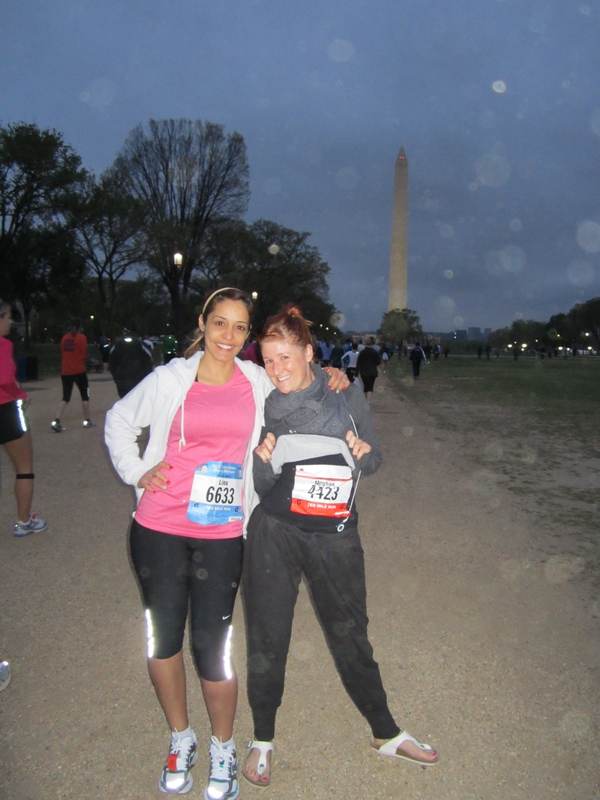 The Cherry Blossom 10 miler is as you can see, very dear to my heart. It was my first race, one that defined me as a runner. It is not only the race that I do every year, but it also symbolizes the starts my running season. Below memories from previous Cherry Blossom 10 miler races. This winter disappointed me, badly. It flew by with it’s boring mild temperature days. No being snowed in, no exciting, beautiful, white outs to speak of, not even a light white blanket of dust. How ironic considering my boyfriend and I both gave each other snowboards. I did try once to race down the slopes hardly covered with so called “man-made” snow, but ice is a better word to use to describe it. It was then, that I finally accepted the fact that mother nature was not going to surprise me, by covering the mountains, with her fresh white powder. So I decided to embrace the mild temps and although, it was a bad snowboarding weather, it was actually perfect for running. Honestly, I prefer running in cooler tempts. Maybe, it is because of where I live, but the summers here, are unpredictable and can be quite brutal, last summer, there were days that hit 105, but because of the humidity it felt like 115. Impossible to run in. Not being able to run, made me depressed and anxiety took over my body. So as you can see, I prefer to run all year, rain or shine. However, crisp sunny days, with a mild breeze, around 55 degrees, maybe 60, is ideal running weather. was a mild winter? Whatever it may be, lets live in the moment, Spring is here and it has been quite lovely. I recently heard the quote,”The Earth laughs in flowers,” by Ralph Waldo Emerson, and fell in love with these words. What a beautiful way to describe Spring. Now every time I see a tree blossom or a flower bloom I think of the Earth laughing with delight.